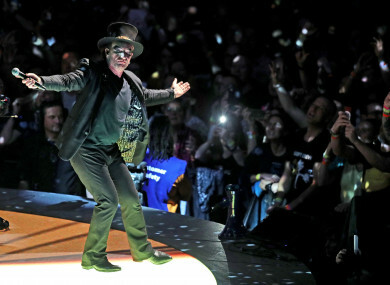 Bono performs at the U2 eXPERIENCE + iNNOCENCE Tour at London's O2 Arena. U2 HAVE TOPPED the list of Ireland’s wealthiest entertainers, and have increased their worth by €15 million compared to last year according to the Sunday Times Rich List. The 2019 list, which will be published in full this weekend, says that the band now having a combined wealth of an estimated €662m. Liam Neeson, Enya and Sir Van Morrison also feature on the list, while Bob Geldof is a new entry to this year’s entertainment top ten, at eighth place, with an estimated value of €57m. Day-Lewis has an estimated wealth of €56m, but has disappeared from public view since retiring on the 2017 release of Phantom Thread. Former One Direction singer Horan, also worth €56m, has sold three million copies of his debut album Flicker, and his 81-show world tour last year took $24.7m at the box office. Email “U2 top list of millionaire Irish entertainers, with estimated worth of €662m”. Feedback on “U2 top list of millionaire Irish entertainers, with estimated worth of €662m”.